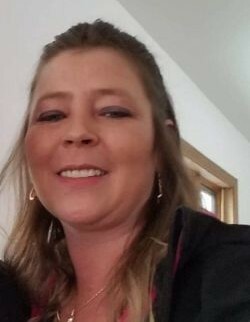 Terresa Marie Orman-Provost, 48 of Fife Lake, died December 2, 2018 at Munson Hospice House. She was born February 16, 1970, in Traverse City the daughter of Albert Orman and Vicki Pace. Terresa cherished the time she spent with her grandchildren. She enjoyed the great outdoors and could often be found fishing, mushrooming, or gardening. She also enjoyed watching beautiful sunsets. Surviving Terresa is her husband Terry Provost, mother Vicki (Jim) Williams of TN, her children Angela (Eric Vance) Finch of Rapid City, Tosha (Josh Hildebrand) Finch of Rapid City, Trisha (Dakota Maxwell) Finch of Cadillac, step daughter Teri (Fred Risteau) Finch of Bellaire, brother Bud (Lori) Orman of Mancelona, grandmother Helen Eckler of Lansing, 7 grandchildren Krista, Roman, Jayden, Keefton, Kayzlynn, Tanner, Jason, plus one on the way, and father in law Larry Provost. She was preceded in death by her father Albert “Butch” Orman. A celebration of life will be held Wednesday, December 5, at 1 p.m. at the Antrim Church of Christ with Pastor Mark McCool officiating. Memorials can be directed to the family.